Yoga, an ancient practice, has become increasingly popular in today’s busy world. For many people of all ages, yoga provides a welcomed retreat from their otherwise frenzied lives. Whether you are practicing yoga in a studio or outdoors, yoga is known to provide a wide variety of mental and physical benefits. There are many types of yoga, though the focus on breath and self-acceptance is universal across all types of yoga. 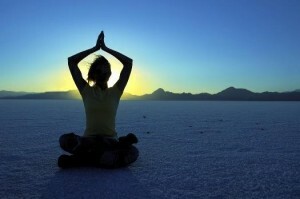 Yoga helps one who practices with self-awareness, to help you develop breath and strength of mind and body. Mindful eating: mindfulness refers to a focus on the present moment, without judgment. Practicing yoga has been linked to mindful eating, which includes an awareness of what food looks, tastes and smells like, as well as an appreciation and enjoyment of the process of eating. Weight loss: As an extension of the mindfulness that is encouraged in the practice of yoga, research has found that people who practice yoga are more in tune with hunger cues, the feeling of being full and an overall more positive relationship with food. In fact, reports indicate that people who practice yoga regularly have lost weight or gained less weight as they age, and have lower body mass indexes (BMIs) than those who do not practice yoga. Cardiovascular: Several studies show yoga is linked to improved cardiovascular health, including lower blood pressure in persons who suffer from hypertension, improved lipid profiles in both healthy patients and persons with known coronary artery disease, and lower blood sugar levels in persons who have been diagnosed with non-insulin dependent diabetes. Yoga can bring calm, mindfulness and many other health benefits to your busy life and nothing is more important than your health. Yoga sounds like it’s pretty great. I love the fact that it can help me be more mindful of what I’m eating. If yoga can help me be more health conscious in all these aspects of life, I think I need to try it out! I like when you said that yoga can actually help in losing weight and stabilizing their BMIs. This makes sense when you’re becoming attune with your body that your appetite normalizes the same way as the quality of increases. I gained a lot of pounds as a result of stress-eating and I feel that taking yoga classes will help me put back into shape. I’ll search for any yoga studios near the area and inquire about their services and practice. Thank you for this! Yoga is very beneficial for our body health. Your blog is very interesting. Thanks for sharing it. Keep posting for more. I thought ti was interesting how you pointed out that yoga can actually help you lose weight because of the mindfulness benefits yoga brings. I’ll definitely keep this in mind since I’ve been thinking of ways in which I can lower my body weight. How many yoga classes should I take before I start to see these sort of benefits?